The policy of anti-Russian economic sanctions adopted by the European Commission and the US administration includes putting pressure on smaller European countries outside of the EU that did not initially support actions against Russia. It is these countries that are suffering the most from the EU/US sanctions and Russia’s counter-sanctions. In mid-July 2015, Iceland, Montenegro, Albania and Liechtenstein were finally pushed into joining the anti-Russian sanctions of Brussels and Washington. But what happened before that? According to foreign trade statistics for September 2014 to June 2015, EU countries, the US and Canada reduced their imports of Iceland’s main exports (fish and meat products, wool and aluminium) by a combined total of 20 per cent and cut their imports of Montenegro and Albania’s main export range (fruits and vegetables; meat, wine and fish products; Albanian bitumen and Montenegrin aluminium) by approximately 15 per cent. They have even reduced their imports from the tiny country of Liechtenstein (precision instruments, meat and dairy products, and wine). And all this bearing in mind that Europe and North America are the main markets for these countries’ exports. In addition, investments in transport, energy and industry projects in these countries have been partially frozen. 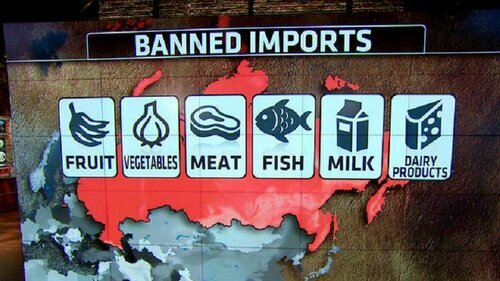 Since 3 August 2015, Albania, Montenegro, Iceland and Liechtenstein have been included in the list of countries whose products are now subject to Russia’s food embargo. Shortly before this, Iceland and Liechtenstein had been planning to resume talks on a free trade zone with Russia and the EAEU, while Albanian and Montenegrin representatives had been in negotiations with Russian trading companies to further increase food exports from these countries to Russia. Moreover, the cumulative value of these countries’ exports to Russia almost doubled between August 2014 and June 2015. Now, however, this process has been brought to an end. The interests of these four small countries are simply not taken into account by the ‘united Europe’ represented by Brussels bureaucracy. Note that after August 2014, Russia became one of the main markets for Icelandic fish and Montenegrin horticultural products (owing it to the withdrawal of suppliers from NATO member countries and Australia). The Russian embargo is being felt acutely in Reykjavik. Icelandic Prime Minister Davíð Gunnlaugsson has complained to Dmitry Medvedev that Icelandic business is suffering more than the other countries placed under embargo. But by agreeing to join the anti-Russian sanctions, did Mr. Gunnlaugsson really expect something different? The move provoked a lot of criticism in Iceland. Former Minister of Fisheries Jón Bjarnason has described Iceland’s support of the EU sanctions as “extremely ill-thought-through” and a threat to Iceland’s self-determination: “Freedom to trade is the cornerstone of a nation’s independence and decisions of this type should be taken at home, not as a ‘tagger-on’ to other countries or unions.” And it seems that it is not just the Icelanders who regard taking account of the notorious “common interests with Western society” in issues of trade as foolish. Montenegro’s Minister of Agriculture and Rural Development, Petar Ivanović, says that in the first six months of 2015, Montenegro’s food exports fell by 30 per cent. This was partly caused by Russia’s ban on the re-export of agricultural products from EU countries through Montenegro to Russia. At the same time, the Montenegrin media is reporting the inevitable forthcoming crisis in the republic’s wine-making and horticultural sectors given the extension of Russia’s embargo to include Montenegro (until now, at least half of the exports of these Montenegrin products were being sent to Russia). The President of Montenegro Filip Vujanovic has spoken openly about the republic’s motives for joining the sanctions against Russia, explaining that a candidate country for accession to the European Union and the North Atlantic Treaty Organisation definitely needs to comply with EU and NATO policies and follow their example. No doubts! But the Montenegro’s leaders have to also admit that if they want to “comply”, they will pay for it with deterioration of their foreign trade. Somehow, Greenland and the Faroe Islands (self-governing territories of Denmark that are increasingly leaning towards independence), as well as Serbia, Macedonia and the tiny countries of Andorra, Monaco and San Marino, have not joined the anti-Russian sanctions yet despite the fact that these countries – especially Serbia and Macedonia – are coming under pressure from Brussels in the belief that they too can be driven into the trenches of an economic war against Russia.